Included: Local Guide, helmet, bike & coffee @ C4 plus two other gourmet options. We can fit our private tours to your personal interests or you can leave the planning to us. Our four tour includes stops at our favourite gourmet city stops. Enjoy delicious C4 Coffee at the roastery, cheese at Canterbury Cheesemonger and fantastic gelato at Rollickin'. This is really just a taste! Tell us what you like and we will tailor your tour to suit. Four hours allows plenty of time to ride the city streets. There is a lot of construction activity and plenty of new landscaping worth crediting, plus a combination of heritage sites which have found a new lease of life and state of the art building to admire. The city is made for biking and our local guides will wind through the alleyways, cycleways and carve through the city pointing out interesting facts and history, especially around the changing urbanscape. Hagley Park opens up for easy cycling and a chance to see how the city’s residents utilise the park for sporting and social activities. We give recommendations that can be taken well beyond the tour. For anyone planning to stay in the city for a while we’ll make sure they’re well informed on where to go and how to get there. 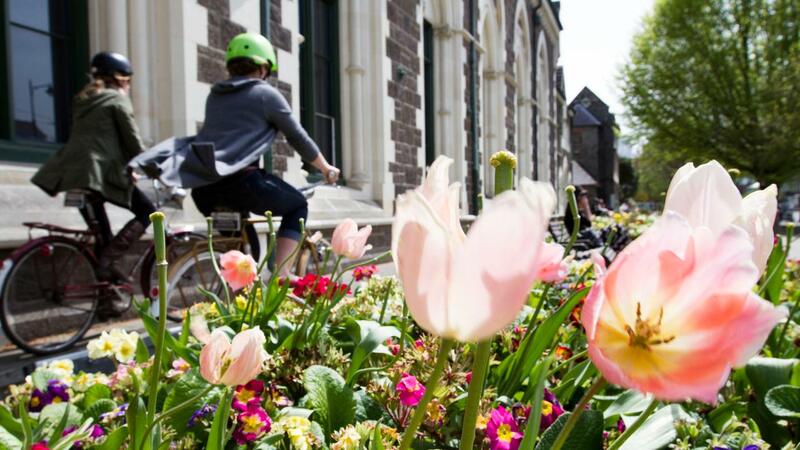 Hagley Park, Avon River Trail, the Arts Centre, City CBD, High Street, C4 Coffee on Tuam St, the Christchurch Transitional Cathedral, Dance-O-Mat, New Regent Street, Margaret Mahy Playground, and an option to include Riccarton House Farmers Market on Saturdays. Our tours are accessible for anyone who can ride a bike. The riding is flat so the focus is more on taking in the sights rather than getting a workout. The start and end point is at Chill Urban Tours, Ground Floor, Awly Building. 287 Durham St North, Christchurch, unless otherwise arranged. Prices include a beverage at C4 Roastery, delicious locally made gelato and cheese tasting at Canterbury Cheesemonger, four hours of time with a local guide, bike and helmet. Please note the minimum price is for two participants - if you are wanting a tour for one person please select two participants and let us know just one person will be riding. Or you might like to view or City Tour option and join a guided group tour. Got a question? Please contact us for more information, email explore@chillout.nz or phone 03 365 6530.